SO THE countdown begins – the moment of truth arrives. 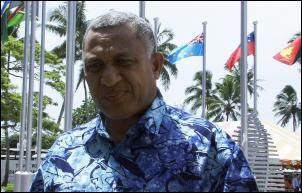 By midnight on May Day, the Fiji military regime of Commodore Voreqe Bainimarama faces suspension from the 16-nation Pacific Islands Forum. And given that the regime leader has thumbed his nose at the Forum May 1 deadline for an announcement of elections and a poll by the end of the year, it seems the inevitable will take place. And then the 53-nation Commonwealth, which will take its cue from the forum, undoubtedly will follow suit. The regime is optimistic that the forum won’t take this drastic step right now. Bainimarama wrote an 11th hour letter to the forum explaining the regime’s roadmap ahead leading to a 2014 vote. But the optimism doesn't appear well founded. Bainimarama's strongest supporter in the forum, PNG prime minister Sir Michael Somare, has apparently deserted the regime and is siding with the Australian and New Zealand isolationist push. Australian Prime Minister Kevin Rudd gloated over the claimed United Nations decision not to award any more peacekeeping duties to the Fiji military. The hypocrisy of Australia and New Zealand is deafening. And this can only end badly, even disastrously for the region. The regime is likely to respond with anger. Will it be time to toss out the Australian high commissioner? The forum has never taken such drastic action against a member in almost four decades of virtual “Pacific way” consensus. If it does so this time – excluding the most influential and crossroads island nation of the region – the isolationist policy will come back to the bite the forum in most unpredictable ways. It is this form of conduct towards Fiji that has elicited the response we now have. The seriousness and the severity of response will continue apace. So why not choose a smarter approach? My own view is that the position taken towards Fiji is “lazy”. It is knee-jerk and quite “unsmart” - unless, of course, complete destruction of the Fiji Islands as a state is intended? It appears to be. In the face of increasing aid from China, it is hard to imagine how or why such an un-nuanced position would be adopted at this juncture? That is precisely why I believe the Commonwealth connection is of paramount importance. All our historical ties are to the Commonwealth of Nations and they have the capacity to understand how to engage with Fiji. Painting a military regime into a corner is jousting with fire. The fire is already lit. Why would one continue with such utter folly? However, there is obviously an ultimate end in sight. I shudder to think what it might be. No good will come of it. And those of us on the ground in Fiji who have an inkling of what is intended will never ever forgive such an approach. I should like to remind all those at the Australian National University and in the Australian government that Fiji is not a rugby ball with which one may play as one sees fit. The ordinary people of Fiji deserve better than that. They have suffered for years from what I might call a gung-ho, flippant and off-hand approach from those in this region who ought to have a deeper, more decent, humanitarian concern. Delivering us all into the furnace is scarcely that? For a pair of neo-colonial, ignorant, un-nuanced, non-indigenous bullies with a political system transplanted from the other side of the planet and imposed at musket-point, Australia and New Zealand are very popular places for Pacific islanders to live. American Samoan congressman Faleomavaega Eni Hunkin has hit back at criticism of his meeting with Bainimarama. He has again condemned Australia - and also New Zealand's "shameful" policy over Fiji citizens, saying that Fiji needs dialogue now at this critical time. Café Pacific notes a couple of pieces worth checking out at the Pacific Media Centre - David Robie's round-up of Fiji censorship and David Brooks' focus on the blogosphere. Over at Global Voices, Michael Hartsell examines the crisis of the forced retirees - all those in the civil service over the age of 55. While the Public Service Commission has said more than 1600 public servants are affected by today's deadline (Bainimarama, who turned 55 earlier this week, is exempt), one blog has estimated that the true figure is closer to 2200. 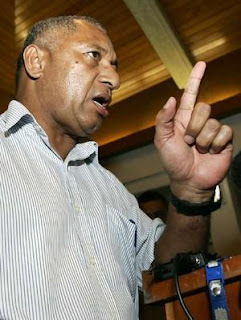 Picture of Voreqe Bainimarama in Nuku'alofa, Tonga, in 2007 in more optimistic times by Scoop co-editor Selwyn Manning. FIJI news media seem so banal these days, deprived of their usual gutsy, punchy and lively political stories and debate. Sport has taken over on many front pages. “Gateway” Fijilive – the website that took the world by storm during the George Speight coup in May 2000 – offers headline stories such as hotel bank loans may be linked to local and environmental value, a downtown jewellery theft in Suva and five being held over a murder. But the global scare of the moment on swine flu virus has an impact here too. The odd story like defence chief Ratu Epeli Ganilau being in Tonga (he says the military doesn’t need downsizing) for a regional “security” strategic meeting gets a run. And, of course, a chief headline on Commodore Voreqe Bainimarama and his top brass getting gongs for “services to humanity”. A handful of international journalists and some are doing a fine job on the ground - Philippa Tolley of Radio NZ for example. In a Listener article this week, entitled "Sticking to his guns," Rebecca Macfie asks while Bainimarama says he wants a racially fairer electoral system, "are his more self-serving motives catching up with him?" The regime plans to review the martial law parameters now that the country has endured two weeks of censorship. Hopefully the decrees will be relaxed. It's human instinct, people want to know what's happening and when somebody spreads a rumour it spreads like wildfire and it's very destructive… [The blogs] have taken over the role of the conventional journalism by informing the members of the public. In another article, Pacific Media Centre’s David Robie wraps up the state up of play with the crisis. While the local media remain gagged, more international journalists have filtered in –providing they were” approved” by not being in the regime’s bad books (ie. filing earlier stories that annoyed the military and/or some of its civilian henchmen). He notes that the media have become rather muted, but not for long. He has spoken on the creativity and adaptability of Fiji journalists and opined that they would find other ways to dodge the gag. A STORY that didn’t rate too highly in the Australian and NZ press this week was Congressman Faleomavaega Eni Hunkin’s "advice" to US Secretary of State Helen Clinton to take a reality check on the briefings being dished up by Canberra and Wellington. This was important for two reasons: First, somebody of his stature in the Pacific giving prominence to another, more conciliatory view on Fiji. Second, it highlights the lack of an effort on the part of “big brother” media in the region to get the diverse and balanced Pacific viewpoints over Fiji. One of the few journalists to be diligent in this respect is Radio NZ's Richard Pamatatau who has consistently provided fresh angles in his Pacific reporting. Faleomavaega met Clinton after returning from a visit to Fiji (he met privately with regime leader Voreqe Bainimarama and former prime minister Mahendra Chaudhry) and his message was don’t listen to the “nasty accusations” against Fiji and the country shouldn’t be pressured into rushing into elections – it isn’t ready yet. According to a statement from his office, Faleomavaega said: “The situation in Fiji is more complex than it appears. [The United States] has had no coherent policy toward some 16 Pacific island nations; very indicative of the fact is that we have not had any USAID presence in the Pacific region for many years now." And for too often, and for too long, Madam Secretary, in my view, we've permitted Australia and New Zealand to take the lead even when Canberra and Washington operate with such a heavy hand that they are counterproductive to our shared goals," Faleomavaega added. It makes no sense, Madam Secretary, for the leaders of New Zealand and Australia to demand early elections just for the sake of having elections in Fiji while there are fundamental deficiencies in Fiji's electoral process, which gave rise to three military takeovers and even a civilian-related takeover within the past 20 years - along with three separate constitutions to govern these islands. I totally disagree with the nasty accusations that the leaders of New Zealand and Australia have made against Fiji given the fact that it's more complicated than it appears. The good congressman completely ignores the fact that the regime in Fiji is a military dictatorship. And that Bainimarama’s regime has been engaging in a ruthless crackdown on dissenting public opinion and complete suppression of the media. Is not freedom of speech, freedom of the media and engaging in free and fair elections hallmarks of American democracy? ONE OF the curious things about this second phase of Fiji’s fourth coup, or "Coup four and a half", as one news blog dubs it, is the limited analysis in the New Zealand press. Radio New Zealand’s Sunday and TVNZ's Media 7 and a handful of fringe radio and television programmes have tried to add some depth to the debate, but apart from one or two analysis pieces from predictable commentators far from the scene there has virtually been nothing in the newspapers. None of the regional and international commentators from the University of the South Pacific - including military specialist Dr Sitiveni Ratuva - have been used – even when there was a window of a opportunity before the crackdown snuffed out dissent. NZ media largely concentrated on the expulsion of three journalists in the first few days of the crisis. A small range of politically correct sources who would be safely vigorous in their condemnation were used. No scratching of the surface. 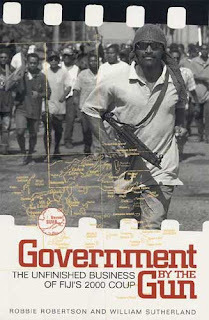 What we witnessed was another coup ranking with Sitiveni Rabuka’s second coup in September 1987, four months after the original May rebellion that launched Fiji’s so-called “coup culture”. But unlike all the previous coups, Voreqe Bainimarama’s consolidation of power didn’t even make front page news in the largest paper, New Zealand Herald. Instead, only a couple of single column items were tucked away in the paper over Easter weekend. The country is on the verge of bankruptcy. Overseas investors are reluctant to invest because of the country’s political climate. The cost of basic food items are sky rocketing and thousands of families cannot afford to put food on the table. Many people will lose their jobs because the private sector will not be able to generate new jobs – it’s a very, very bleak future. In the Philippines, a New Zealander has been arrested as a suspect involved in the Makati City business mutiny in 2003. According to the Philippine Daily Inquirer, a Kiwi was seized along with six retired and unnamed military officers by special police. Chief Superintendent Leon Nilo dela Cruz gave no information about the New Zealander’s alleged involvement with the ex-soldiers (now training as VIP security officers), but he had been found to “have an expired tourist visa”, the paper said. 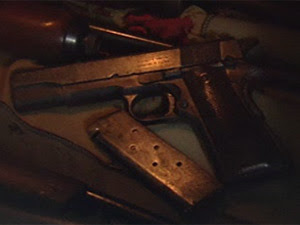 Authorities were still questioning the arrested group over alleged involvement in the shortlived uprising in the exclusive Oakwood Apartments in Makati City in July 2003. NOT CONTENT with gagging the local media and expelling pesky foreign journalists who have got up its nose, the regime is now picking on the Suva-based regional news agency Pacnews. And like their local media cousins, they’re toeing the line. Well, on the surface anyway. But disgruntled journos can’t be gagged for too long. At present, Pacnews is not choosing to include any Fiji stories in its news feed that gets sent out regularly throughout the day. This means it avoids having a censor come into its office to vet stories concerning Fiji. Despite the fact it’s aimed at its regional subscribers, the Fiji government’s spokesperson, Major Neumi Leweni, says if it’s based here it must follow local guidelines: “Well, they are based in Fiji, so they say when you are in Rome you do as the Romans do”. The Pacific Islands News Association, owner of Pacnews, reckons the agency won’t be bowed by the political crackdown. But president Joe Ealedona, who heads PNG’s National Br oadcasting Corporation, says the safety and security of the editorial team is top priority. Meanwhile, amid the climate of self-censorship, the ether is buzzing again. Civil society might have gone quiet for the moment, but cyber society is doing nicely. And it is good to see a few new blogs operating that are being run by journalists with a bit more respect for facts – instead of the rabid hate blogs that have long ganged up on the regime. Welcome to Fiji uncensored and Coup four point five are among recent players. But for a blog that is actually trying to make sense of this mess with some rational analysis, Croz Walsh’s Fiji is still the best. Two good pieces over at the Pacific Media Centre on the comparisons with Thailand and a certain debate on the Marae programme. Finally, a word of solidarity for Television New Zealand Pacific affairs reporter Barbara Dreaver who has responded to the nasty coconet wireless campaign against her over her controversial “guns, drugs and gangs” story in Samoa with a sworn affidavit. TVNZ backs the accuracy and integrity of her report solidly. And so does Café Pacific. She is one of the journalists who have contributed enormously to boosting serious coverage of Pacific issues in New Zealand. Cartoon: Malcolm Evans in Pacific Journalism Review. 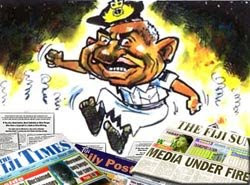 GRAHAM Davis ("Dealing with the dictator", Features, 16/4) exhibits a very common fallacy about Commodore Frank Bainimarama's reconstituted coup. Bainimarama's goal of instituting a non-racial system of voting may be a very laudable objective in a country whose recent history has been riven by racial division. But the means chosen to implement that goal is entirely inappropriate. Many people thought that Sitiveni Rabuka's 1987 coups (and that of George Speight in 2000) had similarly laudable objectives. They were designed to uphold the rights of indigenous Fijians who feared being swamped by Indo-Fijians. In fact, as Davis rightly points out, this was largely a myth perpetuated for more mercenary goals. The consequence for Fiji was a political storm far worse than today's, but within 10 years it had retreated from ethno-centrism and introduced a new Constitution in 1997 that it could rightly be proud of. Speight in 2000 was a bloody reminder of the danger the Rabuka path would always hold for Fiji if institutions succumbed to its logic. Fiji emerged from those political storms stronger than ever, with a hugely sophisticated and active civil society, a dynamic free media and a strong legal system. Yes, the old Fijian nationalist Laisenia Qarase was not as wise as he should have been when in office, but his rule was no dictatorship. He eventually agreed to a power-sharing arrangement with the opposition Labour Party as the Constitution required, and that decision was popular. If allowed to continue, it might have transformed Fiji's politics and helped to break down the racial divisions both leading parties still reflect. In other words, change was already in the air, not least because the purported threat Indo-Fijians posed to Fijian dominance has dissipated. Indo-Fijians comprised nearly half the population in 1987; by 2006 only 37 per cent. It is estimated that their proportion may fall to under 25 per cent by 2020. Under these circumstances, electoral systems will have to change, and such change was already being publicly debated before Bainimarama chose to overthrow the recently elected parliament in which power was being shared for the first time among the representatives of 80 percent of the population. The danger Bainimarama poses lies not in what he says he will do but what he does. Here is a man who claims he and the military forces he represents have the right to interfere in the political process whenever they, and they alone, choose. This is the Rabuka legacy, and if Bainimarama succeeds in recreating Fiji's democracy in five years' time, he will have confirmed for all time the role of the military as Fiji's political kingmaker. Meanwhile, seasoned Australian Pacific affairs journalist Sean Dorney has wowed students at Queensland University of Technology. According to Alan Knight's blog DatelineHK, Dorney says the Fiji media are being forced "to buckle under" and censorship is being branded as the “journalism of hope". In New Zealand, the Television New Zealand Maori affairs programme Marae has featured Bainimarama’s elder brother, Sefanaia. Others on the panel were former Fiji Broadcasting Corporation Ltd chief executive Sireli Kini and Nik Naidu, spokesperson for the Coalition for Democracy in Fiji. Pacific Media Centre news blog has posted an insightful backgrounder about Fiji's woes by advocate against poverty Fr Kevin Barr, who explains the People's Charter process. Also, Violet Cho offers a roundup of reaction. A new media blog, Fijiuncensored.wordpress.com , is focused on Fiji. Why on earth does John Key shoot his mouth off by saying that New Zealand would consider sending armed forces troops into Fiji if they were needed to stabilise peace as part of a multi-lateral action? This uncalled for statement is unworthy of the man many citizens voted into power last year. He would have been better informed to keep quiet. Any moment now, he is possibly going to relapse into quotes from a former leader and say you are with us or against us. Fiji has enough problems of its own. This inflammatory language by our Prime Minister can only feed into the unfortunate poisonous rhetoric of Commodore Voreqe Bainimarama about our country and its politicians. Mr Key, you are my Prime Minister now. Fiji is our neighbour and New Zealand must try to keep dialogue open. How do you do it? I don't know. But I sure can recognise toxic and irresponsible language from our top leader? 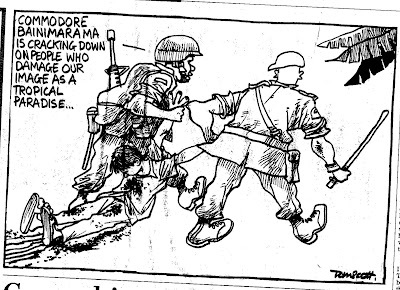 Picture: Flashback to cartoonist Tom Scott's view of an earlier phase of Bainimarama's coup -- Dominion Post, 9 November 2007. MEDIA 7's Russell Brown puts the tough questions about the crackdown on media freedom in Fiji to TVNZ Pacific affairs reporter Barbara Dreaver, Pacific Media Centre director David Robie and Ranjit Singh, a former Fiji Daily Post publisher and now chief reporter of New Zealand's Indian Weekender. But the "gloomy" programme about Voreqe Bainimarama's dictatorship ends with an impassioned tribute to Fiji's young journalists. Radio New Zealand's Sunday Group also looked at the Fiji challenge this week: Moderated by Chris Laidlaw, the panel comprised Janet Walker (a Wellington lawyer who represented the Great Council of Chiefs), Waikato University academic Dr David Neilson (who was part of the Fiji Human Rights Commission inquiry into alleged irregularities in the 2006 general election), RNZ Pacific affairs reporter Richard Pamatatau and former University of the South Pacific academic professor Crosbie Walsh (he publishes one of the best blogs on Fiji). AFTER THE bula welcome this week for "approved" journalists, Liz Jamieson of the London Times has filed a piece from Suva about "terror and threats" at the hands of a tyrant. This should give the sulu censors a choke or two around the yaqona bowl. She describes the recent molotov cocktail season. “We are afraid for our lives,” one of the victims, who would not be named, told The Times. "My wife and I don’t sleep at night, we are always wondering when the next bomb will come or when they will come for us with their guns. I have been imprisoned and beaten all over my body and face; they told me that the next time they come for me my wife can pick up my body from the morgue.” This is not Zimbabwe or Burma. This is Fiji, the tourist jewel of the South Pacific and, until recently, the most sophisticated of the island nations in this region. A world away from the Fiji described a couple of days earlier by the Fiji-born Walkley Award-winning investigative journalist Graham Davis. Previously working with the Nine Network’s Sunday programme, Davis, 56, is now a principal of Grubstreet Media. His article, "Dealing with the dictator", in The Australian had far greater depth and insight. As you would expect with a journalist with much better grasp of the root causes of Fiji’s despair. 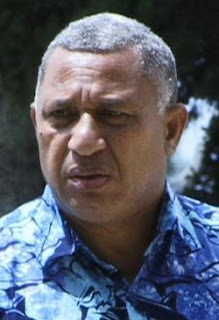 Most journalists are reporting the crisis as if it is something that just brewed a couple of weeks ago, or at the most a couple of years or so ago – when Voreqe Bainimarama staged the first round of his coup and ousted the “democratic” prime minister Laisenia Qarase in December 2006. No sense of the history of the past two decades, or indeed the deep structural political problems and injustice bequeathed to Fiji by the British at independence in 1970. Davis challenged Australian (and other?) media to interrogate the “good guy, bad guy” narrative in a country that under Qarase turned two-fifths of its population into second class citizens. The bad guys, of course, are held to be Bainimarama and his patron, Fiji's octogenarian President, Josefa Iloilo, who have defied the courts by ruling out any popular vote until they can change the electoral system. The good guys are those calling for an immediate election: a coalition of lawyers, human-rights activists and elements of the local media, plus the man Bainimarama deposed at gunpoint in 2006, former prime minister Laisenia Qarase. It's time to dispense with this simplistic premise because a compelling argument can be made that, in fact, the reverse is true; that Bainimarama and Iloilo, for all their flaws, are embarked on the more worthy crusade. Or certainly more worthy than they're being given credit for by their burgeoning number of foreign opponents. 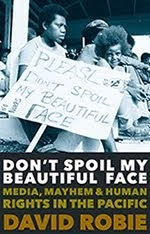 The Fiji saga, by its very nature, defies simplicity, yet stripped to its bare essentials presents the international community with a stark choice between upholding the principle of democracy now and sacrificing racial equality in the process. Wait five years - maybe less if some international agreement could be brokered - and we might get both. His article won applause from Fiji’s chief information manipulator, Major Neumi Leweni, so it’s probably the kiss of death for Davis. In fact, he immediately copped abusive flak from some of the more rabid Fiji blogs. But it is refreshing to have this perspective from Davis, given that most media have not been giving the full story as partially aired on Media 7 and Shine TV this week. Croz Walsh's blog is still the most useful for a running analysis without all the vitriol. One of the most bizarre events of this week of paranoia and the crushing of free speech was the spectre of the man who started Fiji's coup culture, Sitiveni Rabuka, calling for a free media. Rabuka - who staged both of the original coups in 1987 and then was elected prime minister twice – also called for the regime to relax its crackdown and open the door for foreign journalists. However, to his credit, after the rough times he dealt the press in the barracks' year zero, he mellowed and his charismatic style and openness was genuinely liked by most media people. A contrast to Bainimarama. Ironically, his military boss (and chief) whom he ousted as a commoner (unthinkable then) in the double coup in May 1987, Ratu Epeli Nailatikau, is now Vice-President of the Easter regime. THE OTHER side of the story: Fiji's Commodore Frank Bainimarama has outraged other members of the Pacific community with his actions to maintain control in the island nation. 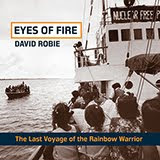 Associate Professor David Robie of AUT's Pacific Media Centre tells Nzone Tonight's Allan Lee about the background to the current unrest and explains its huge significance to the region. Nzone Tonight is broadcast every weeknight at 6.30 and 9.30 on Shine TV, Sky digital channel 111, a network of the Rhema Broadcasting Group. THE FIJI regime hasn’t stopped at booting out three Australian and New Zealand journalists. After a raid on the regional news service Pacnews, another journalist has been detained and others are on the “wanted” list. Ironically, this comes just when the regime’s Ministry of Information has put out a statement claiming that international reporters are “most welcome” to come to Fiji – providing they report “accurately and responsibly”. Pita Ligaiula was escorted out of his Pacnews newsroom in Suva earlier today ago by two police officers and senior Ministry of Information officer Viliame Tikotani. The regime isn’t too impressed with the stories running under his byline for the American news agency Associated Press. Two other local journalists reportedly in the regime’s sights are Ricardo Morris (stringing for Radio Australia) and Matelita Ragogo (Radio New Zealand). He is now free after spending 12 hours in police custody. Meanwhile, Information Secretary Major Neumi Leweni says in a statement that the regime now welcomes foreign journalists. He says the regime didn’t stop foreign media representatives before the 30-day emergency regulations were imposed. The statement appears to contradict the regime Prime Minister, Commodore Frank Bainimarama who told Radio New Zealand's Morning Report yesterday foreign journos didn’t need to go to Fiji. Just ask him the questions, he said. This followed the expulsion of three media people from Australia and New Zealand on Tuesday – ABC’s Pacific correspondent Sean Dorney and New Zealand TV3’s Sia Aston and cameraman Matt Smith. Leweni claims Fiji is like many other countries where entry by journalists is controlled: "Fiji is no exception. Journalists who have been deported because they breached the visa conditions will not be allowed back into the country." Reporters Sans Frontières and many other media organisations (including the Pacific Media Centre) have made strong condemnations of the regime’s assault on free speech and media freedom, RSF claiming that Fiji’s media had been dealt a “mortal blow”. The military government is heading dangerously towards a Burmese-style system in which the media are permanently subject to prior censorship and other forms of obstruction. We appeal to the international community, especially the European Union and United Nations, to respond to this manifest desire to restrict the free flow of news and information by speaking out and firmly condemning media censorship. I guess back in 1987 or even 2000 some people were saying that the coup was all right because it was for indigenous rights. Even before the 2006 coup the president of the Fiji Labour Party said that the next coup would be different because this time it would be for the Labour Party. Well now we have that coup revealed finally for what it always was, and regardless of Frank's democratic motivations it is still a coup, people have been killed, jobs lost and rights removed. For me it's hard to imagine what sort of Fiji Frank will allow. Even if he is true to his word and he changes the constitution to remove racial voting (a good thing) he and his military will have established their pre-eminence politically and will always sit in the wings deciding which government should come in and which should go. A handy news blog (published by journalists) for updates is coup four point five and an independent roundup of blogger views is at Global Voices. For a more balanced assessment of developments than most of the media, check Croz Walsh's Fiji and Gordon Campbell and Shailendra Singh's backgrounders on the complexities are also useful. Graham Davis, writing in the Australian, about "dealing with the dictator" is also far more perceptive than the simplistic narratives being served up in the New Zealand media. Graphic: Malcolm Evans cartoon for PMC's Pacific Journalism Review adapted by Josephine Latu for Pacific Media Watch. MAKING news in Suva is what’s not making news, reports Rebecca Wright for New Zealand’s TV3 Lateline show. The only story on Fiji Television to make it past government censors was about 24 people being held in policy custody for minor offences. 3 News reporter Sia Aston and cameraman Matt Smith were not jailed, but they were harassed and then deported when their efforts to report on Fiji's latest political crisis upset the regime of Commodore Voreqe Bainimarama. “They want nothing but positive stories about the regime, the interim government. Anything outside that is just not allowed,” says Ms Aston. Wright went on to quote Pacific Media Centre director David Robie: “It’s a classic situation that if you're going to have full out military control, you've got to have control of the hearts and minds of people and control information.” But only a couple of sentences or so were used out of quite an extended interview. Robie actually had quite a lot to say about the “sulu censors” and the latest censorship regime back in Fiji that vanished into limbo. Incidentally, the TV3 anchor for this story was ex-Fiji TV presenter Rebecca Singh. Tonight, Russell Brown’s Media 7 team did another programme about the Fiji crisis with TVNZ Pacific affairs reporter Barbara Dreaver, former Fiji Daily Post publisher and columnist Thakur Ranjit Singh and David Robie. Watch out for it on Thursday night on the digital channel TVNZ7. Meanwhile, Reporters Sans Frontières have come out with another tough statement against the regime, accusing it of dealing a “mortal blow” to press freedom and moving to a Burmese-style militarised system of prior restraint and censorship. In another development, journalism and media schools have now broken their silence over the Fiji crisis with a timely statement supporting expelled Australian Broadcasting Corporation journalist Sean Dorney and Fiji journalists who are being harassed and intimidated. See professor Alan Knight's DatelineHK blog for the full statement and 44 journalism and media educator signatories. So – only good news can be reported. Wow –perhaps the army can try and shut down Al Jazeera, BBC and CNN too? I notice their reporting doesn't praise the army for their actions. Fiji journalists must be finding it hard to discover what good news there is to report on the army? Commodore, your actions this week have surely given a new lease of life to Fiji blog sites. 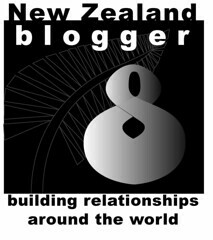 For us in NZ – and Oz and elsewhere – where else should we now look for news on Fiji, but through the blogs? I read tonight on a blog site that the army is taking petrol from gas stations without payment – true or untrue? How am I to assess the truth of this comment – not from the Fiji newspapers, surely? They won’t be allowed to print that type of bad news, even if it is true? So… a wait until possibly 2014 before the citizens of Fiji can vote for the government they want? Most governments voted by the people, would not get that lease of life with long term promises to improve the lives of their citizens. From 2006 until 2014 is eight years… a long time for a visionary leader to prepare policies of political change. Too bloody long. It’s surely time for citizens (and those who wear army uniform too) to tell you, Commodore, about the real world of politics. Last year, the now defunct National Council for Building a Better Fiji (NCBBF) initiated by you, put together a draft of a People’s Charter. More than 200 citizens from all over Fiji helped to draft the “pillars” that defined the content of the charter. John Samy, of the NCBBF Secretariat, worked through these ideas and put together a draft charter. The secretariat then set about spreading the ideas among the public for them to comment upon. The work involved printing and distributing between nearly 200,000 of copies of the draft People’s Charter in the three main languages; setting up TV interviews and approving a radio campaign of over 100 mini-programmes and adverts on the draft charter content. I know about the radio side as I put the radio programs together. Some of them were repeated more than five times a day for several months on English, Hindi and Fijian language radio stations. It may be useful for you, Commodore, to look again at the draft of the People's Charter - especially Pillar Eight. My draft copy says that the “way forward” includes reducing the incidence of poverty by 50 percent by 2015. Nearly 200,000 of your people live in squatter camps. If the scenario of a democratic election does not take place in 2014, a new government will take one look at this worthy Pillar and say… it was your responsibility Commodore – you were in total control of Fiji since 2006! There will also be serious questions to ask the President, but will he be around to answer and give his point of view? He is an old and frail man. Commodore – you chose to be a politician. You will be judged by the people of Fiji on your achievements, i.e. providing jobs, housing, health care and education, and not by rhetoric and your ability to dance around kicking the constitution and journalists. I’m from New Zealand, we have a democracy – it is flawed – all democracies are. But our politicians are judged and returned or replaced by us – even if it is only once every three years. Helen Clark was voted out and left quietly, if John Key loses the next election, he too will bow out with grace. Democracy is far from a perfect system. But even giving you credit for doing what you did with the best of intentions, you may well end up in your old age looking back and seeing that the forthcoming 2014 elections did not solve the serious problems of Fiji. And, in case I forget, the Fiji media will report that news in great detail!!!! You kicked out the Constitution, why not just pass a decree changing the voting system and putting the draft of the People’s Charter into law. All it needs now is a stroke of the pen – or ink on the muzzle of your gun. You could do the task in five minutes. Patrick Craddock is former lecturer in broadcast journalism at the University of the South Pacific and former social media educator for the National Council for Building a Better Fiji. 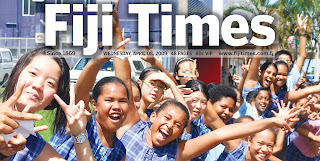 Pictured, the Fiji Times in a happier mood on the day before the Appeal Court judgment ruling the regime illegal - and the subsequent clampdown on press freedom. Once again, the New Zealand media has failed to give a wide enough range of analysis and opinion on the complexities of the Fiji crisis. While this major upheaval (albeit predictable) is happening right on our doorstep with enormous consequences for the region, the country's largest daily newspaper, the New Zealand Herald, could only find room for two short single column stories tucked inside the print edition. Both had local angles only - the first on Saturday in the Weekend Herald summed up Foreign Affairs Minister Murray McCully's view (on page 4) while eight pages of foreign news carried not a word about Fiji. Today's coverage highlighted Australian PM Kevin Rudd's reaction on page 2 and six pages of foreign news were astonishing for the absence of Fiji. Café Pacific offers a commentary from longtime NZ academic in Fiji Croz Walsh whose blog provides many insights that no other local media provides. I WOULD have preferred a few days to reflect on Good Friday's developments but given that others are not disposed to do so, I add my thoughts for consideration. Leave aside for the moment the rights and wrongs of events of Friday, 9 April 2009: the Appeal Court's decision that the President's appointment of the Interim Government in 2007 was unlawful; Commodore Voreqe Bainimarama's apparent acceptance of the decision; the President's abrogation of the Constitution, and the reappointment of the Interim Government, together with decrees dismissing the judiciary and limitations on media freedom. These are matters we can address later. First, what on earth did the court (and Laisenia Qarase who had challenged the earlier High Court's decision that the Interim Government was lawful) expect? That an adverse decision would see the President comply with the Appeal Court ruling -- which may yet be appealed? That Bainimarama, the military leaders and the Interim Government would abandon their 2006 takeover objectives and hand everything back to Qarase so that things would be just as they were before, bowing to the racial and religious extremism that had infiltrated the Qarase regime? Because that is exactly what a new election under the existing undemocratic and racially-skewed communal voting system would produce. Abandon the work done on the People's Charter and the President's Political Dialogue Forum; a fairer electoral system; provision for tri-lingualism in schools and government offices, that could lead to a more tolerant and inclusive Fiji? Abandon work on the renewal of land leases, the sugar industry, rural infrastructure, the NLTB, fairer land rent returns to ordinary Fijians, a minimum wage, and the work on poverty reduction that could lead to a fairer, more equitable Fiji? Abandon work (that has proved exceedingly difficult due in part to the denied absence of overseas forensic accountant experts) to expose corruption and clientism at the highest levels, but which most surely benefits sections of the business and chiefly elite? Throw two and one-half years' work, opposed at every turn by Qarase and others who could have cooperated had they really believed in democracy, into the old Lami rubbish tip? Secondly, how are the (new) Interim Government, their opposition, the media and "moderate" NGOs, going to handle this new situation? The answer to these questions, at the moment, seems to be: "very badly." Commodore, it is essential the emergency regulations are implemented with restraint and removed as soon as practicable. Akuila, I have respected you since the mid 1970s when you protested the expulsion of the Malekula squatters at Flagstaff. And Netani, who I have never met, you have blanked your Fiji Times pages in protest of censorship. I respect your courage and intent but surely neither of you, Akuila and Netani, support the return of a racist regime. That, ultimately, is the choice. Look at the bigger picture, beyond the clumsiness, provocations and abuses of power by the Interim regime. Continue your protest but with judgment. Keep the end in sight. Think. What, in this new situation, is best for Fiji? This is not a moment for prevarication. Now, you have to decide between the known racist and undemocratic stance of the Qarase regime, and the suspect but probable good intentions of Bainimarama. Negotiate and be patient for space to comment objectively. For freedom of the press. A hard stance now could see all doors closed, and your important contribution to Fiji's future denied. This may soothe your justifiable pride, but it will not help Fiji. Thirdly, what is going to be the reaction of the "international community"? Well, here at least there are no surprises. They are handling the new situation as they did before, within the narrow blinkers of supposed "democracy" and "media freedom." They, who earlier rejected the findings of the Fiji High Court (because it did not support their position), now accept without question this decision of this first Court of Appeal, because it does (even though it yet may also be appealed). From my New Zealand, Foreign Affairs Minister Murray McCully, a total denial of realities. Honestly, Minister, what do you know about Fiji? Who, if anybody, are you listening to? In MFAT or in the NZAid you would see ended? To my friends, if I may call you that, Jim Tully on media and Rod Alley of the Beaglehole-Somerset-Alley conjoined clans, other than your illustrious ancestors' contributions to liberal causes, what is your special expertise on Fiji? And to my friend Toke Talagi, chairman of the Pacific Island Forum, why has Australia and New Zealand spoken with no reference to you? Do they chair the Forum? What also of other Forum members? Are their opinions of less importance than NZ and Australian commentators? The role of the international community is important but not necessarily decisive. Fiji will resolve its own problems in its own way. But the community is in a position to help or hinder, to see whether or not ordinary Fiji citizens, in the key sugar and tourist industries, and their downstream cousins, will suffer unduly. Australia, New Zealand, the ECC and the Commonwealth can devastate the Fiji economy, but still see no "return to democracy." And their continuing inflexible opposition to Bainimarama will further buttress and encourage the Qarase opposition to do what we do not know --- and dare not imagine. My Lords, Justices of Appeal, safely back in Sydney (whose judgment I will later address, because it seems, to this layman, to contain inconsistencies favouring Australian and Qarase positions), how now do you see what your detached, removed, judgment has achieved? Would you not agree that Fiji --ordinary, everyday Fiji, impoverished, bereft, isolated Fiji -- not you or Australia, face the consequencies of what you, in your lofty legal wisdom, judged to be not "chaotic"? And how does this situation, that you have helped create, differ from that the President sought to control early in 2007, using powers you claimed he did not have? Professor Crosbie Walsh is a development geographer who was former director of the Institute of Development Studies at Massey University and then headed a similar programme at the University of the South Pacific for five years. TVNZ stands by the investigative story it aired on Monday [April 6] night exposing gangs engaged in smuggling drugs and guns into Samoa from NZ and the USA. We believe the story was a very real, accurate and fair portrayal of the criminal activity happening in Samoa and will continue to follow this story as it unfolds. Protecting news sources is of the highest priority to TVNZ News and you cannot underestimate the seriousness with which we take this fundamental journalism ethic on a story such as this – therefore we will not comment on any aspect of the story or how we sourced it, including our news crew’s movements in Samoa. Tupuola Terry Tavita, writing in Savali, described how since the screening of the One News item, an alleged gang member, Vaitagutu Lefano, interviewed by Dreaver, had claimed they were asked by the reporter to "play act American gangsters". He also claimed the alleged cannabis they had been smoking was instead "just rolled-up tobacco". The whole episode was staged, claims Lefano. "She told us to act like American gangsters and we thought she was shooting a movie. We didn't know she was doing the news." Not so, says Barbara Dreaver in a telephone interview with Savali. "We took video footage the moment we stepped off the car and those boys were already heavily into it…we also asked them to cover up they faces but they didn’t want to." Police Commissioner Papalii Lorenese Neru told Tupuola that the youths' actions on television amounted to public intimidation and were being investigated. The saga reminds Cafe Pacific of an event in Fiji in 1998 when Monasavu landowners - unhappy about the lack of state royalties for the Wailoa dam in the Viti Levi highlands that supplies 80 percent of the country’s electricity - staged an “intimidating” protest. Daubed in warpaint and wielding traditional clubs, spears and machetes, their protest sparked a complaint to the Fiji Media Council against Fiji Television for screening the item. But clearly for the average viewer it was theatre and not at all threatening.